Skateboarding | Life, Music and the Web… Revived! So one afternoon, after a long day at work, alone at home since my wife has gone to the city proper to process some paperworks, glee is with her of course and so i have nothing left to do and thought maybe it’s good to sweat out some of the excessive fats i have. The past week has been nothing but eating some junk foods and fruit shakes since we bought a blender. So it’s like almost every afternoon my wife makes an avocado shake or any fruit she gets her hands on from the nearby market. 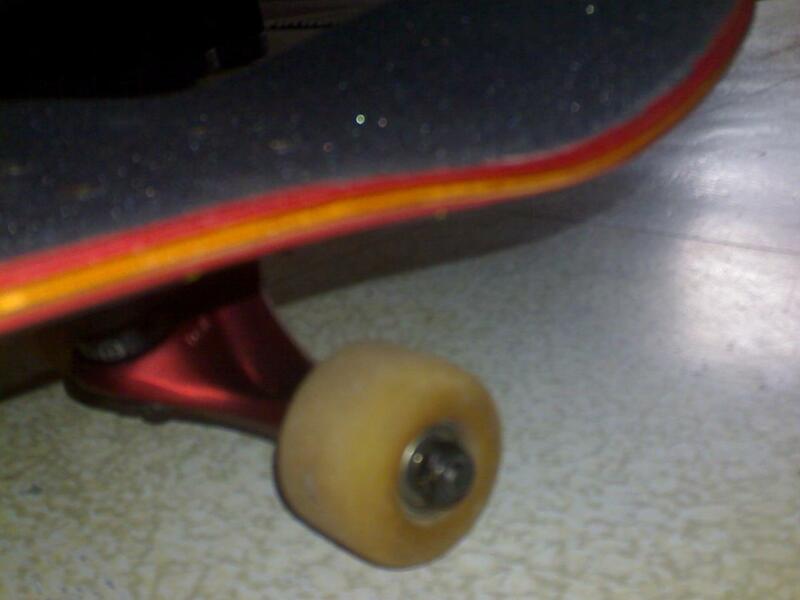 This entry was posted in Personal, Skateboarding on June 30, 2014 by Marco. Zoo York has a lengthy and flavorful history, starting from the earliest days in the ’70s and ’80s when Zoo York was simply a collective of creative skaters, graffiti artists, b-boys and punks getting down for themselves in NYC. In 1993 OG East Coast skaters Rodney Smith, Eli Morgan Gesner and Adam Schatz turned the vibe and storied name into the beginning of the company we know today. A barrage of raw, gritty urban output followed in the form of skaters from the streets getting together with artists and musicians from the streets to create shoes, apparel and skate gear with always-legit NYC heart and soul in the mix, and the look and feel spread around the world with a quickness. In the following years, Zoo blew up and became a huge brand name known everywhere. They’ve managed to keep their East Coast roots strong while expanding their reach, and 2009 finds them dropping a new video (their first in many years) with a largely new crew of team riders. This entry was posted in Friends, Personal, Skateboarding on June 16, 2009 by Marco. this song was written by a good friend morn. we’ve decided to shoot a music video for it and I directed/edited it. The plan was good but it turned out we don’t have much time and so the latter part where stuffed with unrelated clips. i’ve also included some of our skateboard clips with me and dave skating after 3 years of not riding a board. Gladly i can still do some 5050s. lol. so here it is and check it out. and oh please dont hesitate to leave your negative comments. This entry was posted in Friends, Music, Skateboarding on November 19, 2008 by Marco. 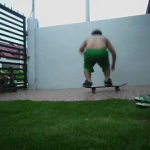 skateboard is good to go!! This entry was posted in Personal, Photos, Skateboarding on October 30, 2008 by Marco. 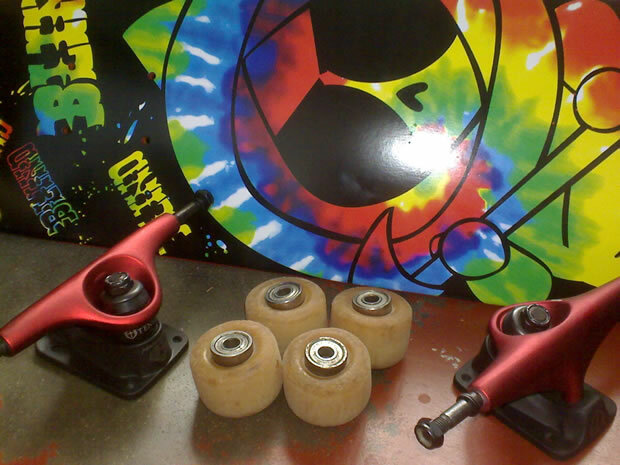 New Deck and Trucks.. yeehaaaa! This entry was posted in Personal, Photos, Skateboarding on October 29, 2008 by Marco. i think I got it wrong… isn’t it bulls on parade? yeah right. This entry was posted in Friends, Personal, Skateboarding on September 4, 2008 by Marco. Each night, when im ready to sleep(you can call it a quick nap, coz i sleep only 3-4 hours a day), i always notice my skateboard under my bed. He seems to be lonely and looks like he wants to tell me that he wants to go out again and hit the streets. But too bad, i cant do it for now. I got really tight schedule with my job. I seem to be workaholic nowadays, working for almost 17 hours a day. 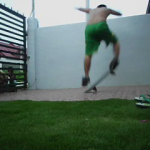 Anyways, thats the reason why i dont have time to spend with my skateboard. 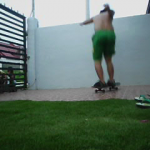 When i was a lil younger(well im still young this day at 21), I had a lot of adventures with my skateboard. We are good buddies, we play wherever we want. I remember those long nights where we skate till 1 am and just stop when it felt like there was no sign of energy left in your legs. Those nights were really happy, happier than the moments i get drunk! 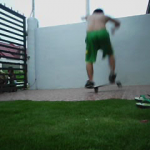 I can still remember those moments wherein i ollied stairs(though not that high), gaps, obstacles and then do tricks with them. 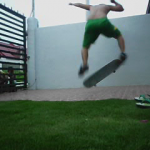 My kickflips, heelflips, shove-its, shoveit flip and a few more. The rail grinds like 50-50s and 50-50s and 50-50s and 50-50s. LOL, coz thats the sole trick i can land in a round rail, but i can do some other few stuffs on a flat bar or on a ledge/box like noseslide, 5-0 and nothin more i guess. 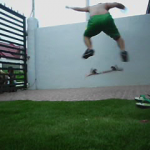 Well i guess i havent got so many tricks like some skateboarders do but what im after for is fun. 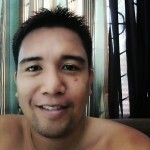 What are those tricks for if your not satisfied and not contented and not feeling happy about what u do. Well, i hope one of these days we can hit the streets again. 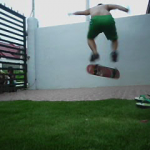 But i wonder if i can still do a low level ollie, i guess not coz right now i have gain more wait and counting. lol. 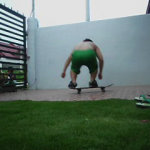 well this might be a good excercise too, skateboarding. You should try it too guys. This entry was posted in Skateboarding on November 29, 2006 by Marco.